Most books about places aren’t usually about the place itself, but rather a convenient way to tell a story that’s much larger than mere geography. A new historic of D.C.’s U Street is a perfect example. 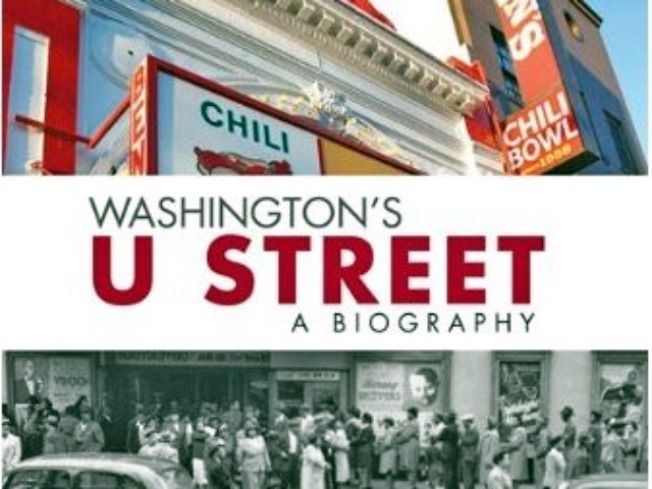 "Washington's U Street: A Biography," a rare piece of D.C. history not focused on the city’s most powerful inhabitants, chronicles the African-American heritage that centers around the area between Shaw, Adams Morgan, Dupont Circle and Columbia Heights. That set of diverging, intertwined storylines has long waited for a suitable telling. Not that Blair Ruble is a natural narrator for this particular tale. A doughy academic at the Wilson Center -- and longtime Dupont resident -- his expertise is in Russian domestic politics, not American race relations. Ruble traces the idea for a book on U Street came to him during a show at Twins Jazz, where he perhaps saw a parallel with his Soviet subject matter. "As I entered the world of U Street, I came to appreciate more and more that its history is about how human beings strive for beauty in the face of stupidity, folly, injustice and brutality," Ruble writes, in what will become a repeating trope about triumph over adversity. He is, if possible, almost too conscious of his outsider status, and seems to overcompensate for it. The book’s mission is to place U Street on the level of other areas more traditionally thought of as cradles of Afro-Americana, like New Orleans or Harlem, and it leads to occasional moments of hyperbole. "U Street was everything that Broadway was, except more so," he says. "U Street combined in just a few short blocks what took Broadway half a dozen miles or more to contain, stretched out along the spine of Manhattan." Even with the occasional academic gobbledegook, that perspective, and the overall thesis of U Street as a forced "contact zone" that’s given rise to immense creativity, helps Ruble highlight some long-running historical patterns. He cogently describes, for example, the criminality forced upon U Street residents by Jim Crow laws that reserved legitimate business opportunities to whites, as well as the interdependence of Jews, Chinese immigrants and African Americans in creating a viable local economy. There’s a fascinating dynamic between the "high culture" of 14th street and the more underground character of 7th Street. One of the book’s strongest elements is Ruble’s intellectual history of Howard University, which highlights how the institution both shaped and was driven by national debates, filtering down to the surrounding neighborhood. He also clarifies some historical turning points. The most striking: What really put an end to the neighborhood's "Black Broadway" heyday wasn't the 1968 riots -- though that certainly accelerated the decline -- but rather desegregation in the 1950s and 60s, which gave elite blacks the option to move to the suburbs or go elsewhere for college. The influx of rural black folks from the Carolinas infused the area with pork and collards and a certain Southern sensibility, drawing disdain from the rest of the city. Occasional big-picture glances at D.C. as a whole, meanwhile, illuminate what didn’t happen to U Street. It escaped the wholesale urban renewal that obliterated the neighborhood fabric in Southwest. The number of things that almost destroyed U Street, from desegregation to subway construction to rising property values that force out long-term residents, make this a much more complicated picture. Of course, for all his analytical firepower, being an outsider means that Ruble’s book is basically a reconstruction patched together from various existing accounts. But being thoroughly versed that historical context gives him a very fine-grained understanding of more recent politics. The latest wave of city politicians, for example, came up through hyperlocal Advisory Neighborhood Commissions, and have a much more practical orientation than their freedom-fighting forbears, sometimes resulting in a feeling that old Washington is being left behind. With his historiographer’s hat on, Ruble criticizes some celebrations of U street’s present, and the simplistic focus on well-known former inhabitants like Duke Ellington and Langston Hughes, for papering over the complications of its past. What drew him off his academic reservation to write this book, after all, were the neighborhood’s contradictions -- its "jagged edge," as he calls it more than once. The author’s embrace of complication, his recognition of brilliance forged out of terribly adverse circumstances, makes the book’s scholarly indulgences worth slogging through. Book Review: A New Biography of U Street was originally published by Washington City Paper on Jan. 10, 2011.